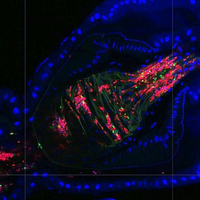 An unusual population of immune cells appears to exist in zebrafish as well as mammals. 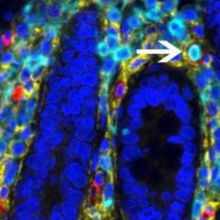 ABOVE: Immunofluorescent staining in gut tissue from adult zebrafish shows T cells and innate lymphoid cells in green. 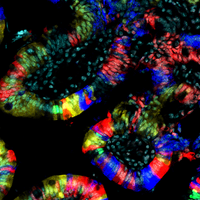 Specialized immune cells called innate lymphoid cells defend against venoms and parasitic worms in mice and humans by producing inflammatory molecules. 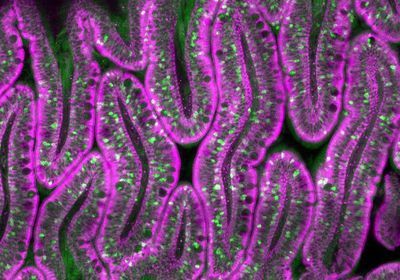 In a study published November 16 in Science Immunology, researchers found similar cells in zebrafish. The authors of the study report they used single-cell RNA sequencing to identify cells with a similar profile to the known innate lymphoid cell (ILC) types found in mammals. However, the ILC-like cells in zebrafish had receptors on their surfaces that are not found on their mammalian counterparts. P. P. Hernández et al., “Single-cell transcriptional analysis reveals ILC-like cells in zebrafish,” Sci Immunol, 3:eaau5265, 2018.